Handscroll paintings, painted horizontally on pieces of silk or sheets of paper and mounted as scrolls, are a major type of traditional East Asian painting, distinctive in their format and method of viewing. Their creation is based on special principles that differ from those of painting single-framed pictures as they are continuous pictures that progress in space and time. Handscroll paintings are meant to be handled as well as seen–unrolled for viewing and rolled up for storage. Viewing section by section calls for particular kinds of engagement or participation on the part of the viewer moving forward (from right to left) stopping and going back. 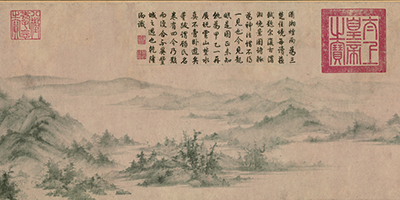 In addition to painted images, the scrolls often include handwritten text, artists’ signatures and seals, and the seals of later owners of the painting. The texts might include narrative and descriptive passages on the painting itself and colophons added at the end, including comments by of the painters’ associates and later viewers, including owners of the paintings. These can provide a social history of the painting. 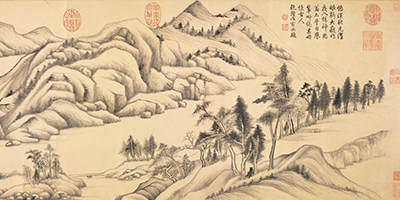 Because of the rare and fragile nature of these paintings, however, they are rarely shown. They cannot be handled by the public or exposed to light for extended periods in exhibitions. 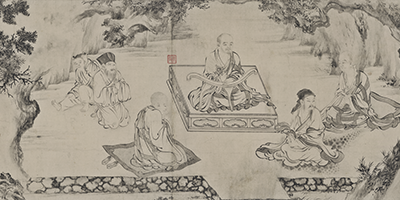 Therefore our center created this interactive site to simulate the experience of viewing handscrolls in ways that published photographs in books and projected slides cannot and to make them more widely accessible for teaching and research. Copyright ©, 2019 CAEA University of Chicago.